Description of Property: Ground floor. This is a large open plan kitchen/dining area, with exotic wood stairs leading to the first floor. 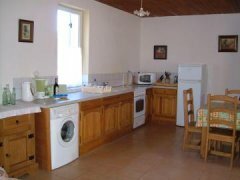 The kitchen is nicely equipped containing a full size gas cooker, washing machine, fridge/freezer and microwave. The furniture is country farmhouse style. The lounge is fitted with a wood burning stove, soft seating, T.V. and D.V.D. player. Also on the ground floor is a shower room with toilet and hand basin. This has 3 double bedrooms, all are furnished with French antique furniture, have chestnut parquet flooring and original oak beams. Also there is a shower room. Outside Amenities: The front of the house has a nice mature garden with lots of different trees and shrubs, providing plenty of shade to sit under and relax. You have your own area with garden furniture and barbeque. The grassland stretches 230 metres to the river bank, large enough for all ball games to be played. Surrounding Area: The village of St Germain et Mons itself has only a primary school, church and Marie. 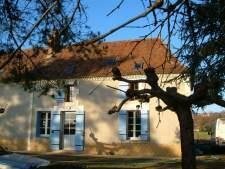 But don't worry - only 1 km away across the river Dordogne is Mouleydier, where you will find all the shops you will need for your daily provisions, even a doctor, bank and post office. Being in an agricultural area there are many vineyards around producing fine wines such as Bergerac, Saussignac, Monbazillac, Montravel and Pecharment. There are many activities round and about including golf, canoeing, walking, horse riding, hot air ballooning, go-karting, tennis and fishing (which is possible at the bottom of the garden, a licence can be obtained at the local shop). You can do as much or as little as you want, there is something for everyone. 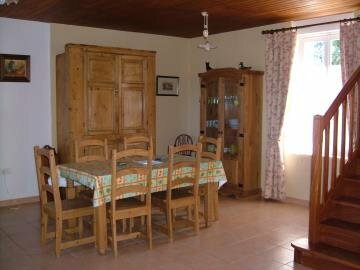 The Dordogne is a beautiful part of France with a very nice climate. It offers thousands of places to visit including Châteaux, Bastide Towns, Gardens, Caves filled with prehistoric paintings, and many restaurants specialising in traditional cuisine. Bergerac was once a flourishing port for the wine trade. 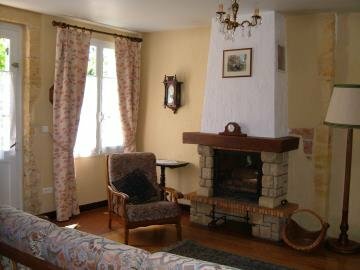 It still today has a picturesque harbour where you can take a boat trip along the river Dordogne, or a miniature train ride around the Bastide town, viewing the many half timbered houses with terracotta decoration. Being famous for it's wines and tobacco there are the museum's Musee du Tabac and the Musee du Vin, de la Batellerie et de la Tonnellerie on the industries recording their history throughout the centuries. Sarlat-la-Caneda is really worth a visit. In the heart of the Perigord Noir, Sarlat grew up around a Benedictine abbey founded in the 9th century. It has a distinct medieval feel about it, with numerous magnificent buildings around every corner you turn. The town's Saturday market is also a main feature with it's truffles, foie gras and mushrooms (depending on the season). Les Eyzies de Tayac is an archaeologist's paradise with many caves containing prehistoric paintings and deposits. Lascaux the famous cave was only discovered in 1940, by four young boys who's dog had fallen down a hole. The cave is made up of four galleries, the walls of which are covered with more than 1500 representations, either engraved or painted. These works were created from around 1700 B.C. Unfortunately opening the cave had a damaging effect, and in order to preserve such treasures was closed. Lascaux II this is a replica of two of the galleries. The artist Monique Peytral used the same methods and materials as the cave artists so the atmosphere of the original cave has been made possible. Château de Monbazillac is a relatively small chateau, which was built in 1550 and is surrounded by a dry moat. Its elegant silhouette is eye-catching, the architectural style halfway between a defensive castle and a Renaissance château. 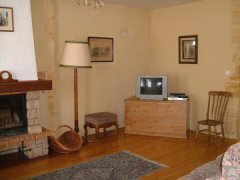 Downstairs has a log burning stove in the lounge area, a parafin heater and the downstairs shower room has an electric heater. 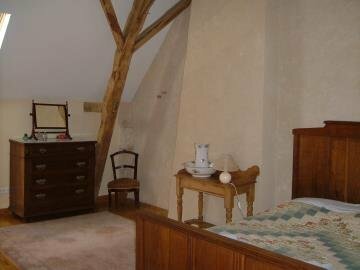 Upstairs, there is an electric heater in each bedroom and the shower room. Mains water. Septic tank. Electricity. WiFi Broadband Internet Access. Television. Satellite TV. DVD. Children welcome. No smokers. No pets allowed. BBQ. Pricing Info: 600 Euros per month from October to June. All utilities are extra, plus logs and parafin. Linen can be hired. A security deposit of 500 euros (fully refundable provided there is no breakages or damage), plus 1 month’s rent paid in advance by bank transfer, cash or cheque.